Check back often as this page could be updated frequently - if you miss a tip or two, just browse through the archives to the right! 05/18/2005 - Tough conditions should change soon. The last two weeks have seen snow flurries, cold temps, and a lack of sun. This all adds up to very cold water on the chain. Water temps on the bigger lakes is only in the 46 degree range! Crappie fishing on the smaller lakes will be excellent in the coming weeks. I did quite well last year with many nice size Crappie in the 10-12 inch range. I expect another good spring this year. All we need is some sun & warm and these fish will be moving shallow! Early ice out should make for good spring action! We have ice - Finally!! A Spring Tip That Never Fails! Big Smallies bite in August! The Weed Walleye Bite is Here! Tough conditions should change soon. Conditions are Great - Get out there and Ice Fish! 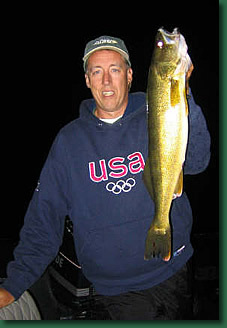 2015 Walleye size limit has changed! Problems? Questions? Comments? Contact Us or E-mail us!